This year we’ve taken up the challenge to combine exercise and fun together to support Sports Relief. 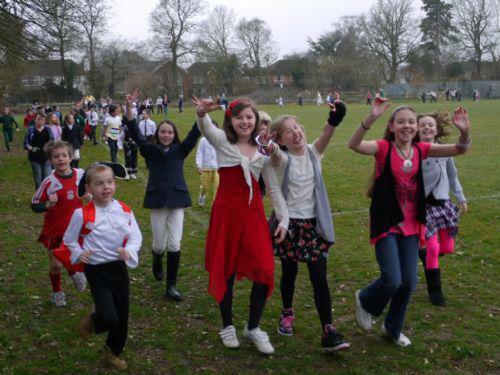 On the 19th March in the morning children (as well as teachers) were invited to dress up as a “superhero/superstar” and participate in a mile run around the field. This was not a race but a fun run for a good cause. Each participant was asked to donate £1.00 to participate in the event. Every participant will receive a certificate commemorating their support for Sports Relief Day. “Great Fun”- Antonia. “I was really proud” - Jake. “ I felt really special to be able to help others” - Emily. “ I felt like a real life superhero” - Gus. And the Headteacher, Mrs. Hilton-Childs commented that everybody was a super hero today, children and staff alike.